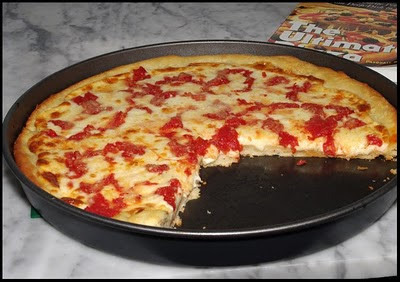 I'm still on a quest to make the perfect deep-dish pizza, coming as close as possible to making a home version of the fabulous pizzas at Lou Malnati's or Gino's East. Chicago style deep-dish pizza has a crust that it almost biscuit-like. It's much more tender than regular pizza crust. 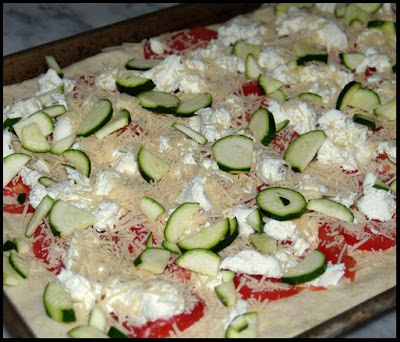 And, the mozzarella goes directly on top of the crust, followed by the tomatoes (not tomato sauce), and grated Parmesan cheese. This is the closest I've come so far to authentic Chicago pizza. The crust was very tender and biscuit-like, but it wasn't quite crispy enough--I'm thinking that I didn't have the oven hot enough. Next time I make it I may try par-baking the crust for 10 or 15 minutes. The toppings were perfect, though I used less tomatoes just because I always like pizzas with very little sauce best. 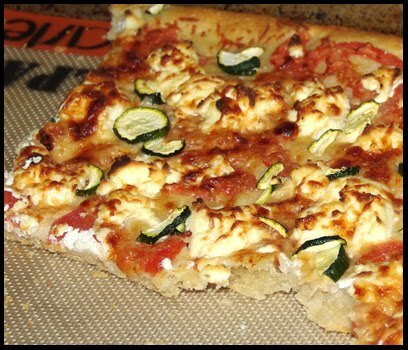 I made a double batch of dough and used the second half to make a pan pizza topped with fresh tomatoes, ricotta, Parmesan, and zucchini slices. It was really good with a nice crispy and fluffy crust. Pour the water into a large mixing bowl or the bowl of a stand mixer. Sprinkle the yeast over the water. Add the sugar and stir to dissolve. Let stand for 10 minutes. Add the flour and salt to the water and stir to combine. Add the corn oil and mix until a dough is formed. Knead the dough for a full 6-7 minutes or until it is completely smooth and satiny. Lightly dust a large bowl with flour. Place the dough ball into the bowl, dust the top with flour, and cover with plastic wrap and aluminum foil. Let sit on the kitchen counter for 20 minutes. Place the dough in the fridge overnight. Put the tomatoes in a mixing bowl. Crush completely with your hands and drain. Crush some more and drain again. You should have almost 2 cups. Add the garlic, oregano, basil, and salt and pepper. Set aside. Arrange the cheese slices, overlapping them slightly, over the crust. Spread the tomatoes evenly over the cheese. Sprinkle on the Parmesan. Bake the pizza on the bottom rack of a preheated 450F oven for 18-20 minutes or until the crust is golden and pulls away from the sides of the pan. Let the pizza sit for 10 minutes before serving. I like the one with zucchini, looks very tasty! mouth watering pizza Michele! tempted to pick! They both look really delicious! I like to par-bake thicker crusts because I can't stand a doughy crust. I had no idea you put the mozz directly on top of the crust! And speaking of, that crust is goooorgeous! It looks so awesomely fluffy! Looks great. I'm not an expert on deep pan, but perhaps some butter in the dough might make it more crunchy? Just a thought..